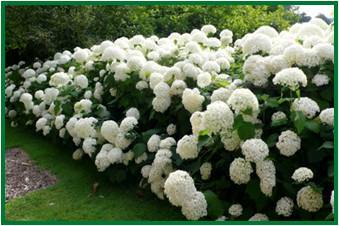 Annabelle Hydrangea is a great selection of Hydrangea to add to any garden. It has large white blooms from early to late summer and is extremely cold tolerant, making it perfect for a New England garden. It may suffer major winter die back and take a hard pruning back in the spring, and still come back to produce a beautiful show of blooms. This variety flowers on new wood and should be pruned back to 2-3 feet in late winter to early spring. This pruning recommendation each season ensures that the stems will be strong enough to hold the large flower heads without flopping especially after a rain. Annabelle Hydrangea does best in a morning sun, afternoon shade - an east facing location. However, it is tolerant of full sun with consistent moisture. This particular variety makes a great foundation planting or planted in a mass of at least three for a showy addition to the landscape. 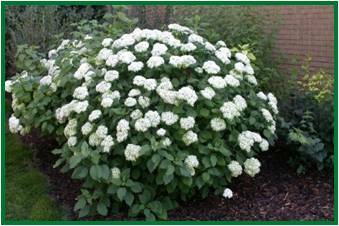 Annabelle Hydrangea is complimented by Blue Princess Holly, Inkberry, Japanese Holly, Mt. Laurel, Rhododendrons and Boxwood. It is also beautiful planted with a mass of perennials such as Veronica, Bee Balm, Daylily, Hosta, Anemone, Coneflower and Salvia to name a few. 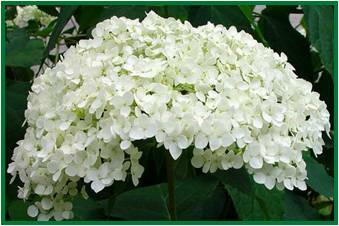 There are new cultivars of Hydrangea arborescens, but at Stratham Circle Nursery, we think that nothing compares to Annabelle!